WASHINTON, D.C. (BRAIN) — President Trump announced Thursday he was beginning to take steps toward imposing tariffs on up to $60 billion of Chinese imports. The move is motivated by the administration's belief that China has a history of forcing U.S.
MANNING, S.C. (BRAIN) — The Trump Administration’s newly announced tariffs on imported steel and aluminum will — at least temporarily — put a jobs expansion proposal by Kent International on hold. WASHINGTON (BRAIN) — The Trump administration's plans to sign sweeping tariff revisions next week could raise the price of imported steel by 25 percent and increase the cost of imported aluminum by 10 percent. WASHINGTON, D.C. (BRAIN) — PeopleForBikes' Katy Hartnett wants to hear from suppliers who want Congress to ease or suspend import tariffs on parts, accessories or products that they sell in the U.S.
WASHINGTON (BRAIN) — Two U.S. Senators have introduced legislation that would lower tariffs — currently as high as 30 percent — on some types of "recreational performance outerwear." Some cycling rain gear might be included in the clothing items that would see a tariff reduction. 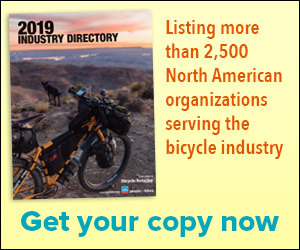 OTTAWA, Ontario (BRAIN) — Bill Yetman, executive director of the Canadian Independent Bicycle Retailers Association, penned a letter to the country's finance minister this week, asking that the government eliminate duties and tariffs on bicycles in Canada. WASHINGTON (BRAIN) — Representatives from the bike industry and the advocacy group PeopleForBikes are proposing the U.S. tariffs on imported bikes be reduced or eliminated because bikes have a positive effect on the environment. KESWICK, Ontario (BRAIN) — Canadian retailers are stuck between a rock and a government unwilling—so far—to drop a proposed tariff increase on imported bicycles despite a shutdown of all major bicycle manufacturing in Canada.